The Perfect Derma Peel is a medium depth professional grade Chemical Peel that helps fight the effects of time, sun damage, and the daily delivered environmental assaults. This powerful yet non-damaging chemical peel can take years off of your aging or sun damaged skin. It is the first peel to incorporate glutathione, the most powerful antioxidant known! It addresses various skin conditions, such as pigmentation abnormalities, post-inflammatory hyper-pigmentation, melasma, and photo damage and laxity. It can be used safely on ALL skin types Fitzpatrick 1-6. The Perfect Derma Peel contains Glutathione, Kojic Acid, TCA (Trichloroacetic Acid), Phenol, Salicylic Acid, Vitamin C and Retinoic Acid. The pH range is 1.3 – 1.5. Self deactivating! The Perfect Derma Peel requires absolutely no pre-peel skin preparation. Patients may use a daily skin care regimen of retinoids up to 3 days before the peel, but should discontinue use at this time. Patients should refrain from using retinoids or glycolic products for 10 days post peel. Day 1-2: The treated areas will feel tight and may appear slightly darker. The day of the peel application is “Day 1.” The peel solution should remain on the treated areas for at least 6 hours. During the first 6 hours, do not wash, touch, rub, or apply make-up to the treated areas. This is essential for full effects. If you are not experiencing any irritation or discomfort, the chemical peel solution can remain on until your evening cleansing or it may be left on overnight. Day 2 (AM): Gently wash and dry the treated areas. Vigorously apply the 1st Post-Peel Towelette to the treated areas. Let dry thoroughly. Towelette solution should be left on for 30 minutes before applying Mineral Perfection/Tinted SPF 30 or an SPF 30. Make up may be applied if desired. Day 2 (PM): 30-60 minutes before bedtime, gently wash and dry the treated areas. Vigorously apply the 2nd Post Peel Towelette to the treated areas. Leave the solution on overnight. If you are experiencing irritation or discomfort, apply a small amount of The Perfect Derma Moisturizer 2-3 times daily. You may also apply a cold compress against the irritated area for relief. If there is no significant irritation, do not use any moisturizing products on the treated areas until peeling begins (usually Day 3). Avoid excessive sweating, sauna or heavy exercise during peel process. After peeling begins, apply The Perfect Derma Moisturizer (included in the Patient Home Care Kit) to the treated areas 2-3 times a day to control the peeling and relieve the tightness. This moisturizer should be used for one week for Caucasian patients and two week for Asian, Hispanic and African American patient. If The Perfect Derma Moisturizer runs out, a 1% hydrocortisone cream may be substituted. Do not rub, pick or pull on the peeling skin, let the peeling occur naturally. Rubbing, picking or pulling may cause scarring. Gently wash (do not scrub) and dry the treated areas morning and night, and apply The Perfect Derma Moisturizer as needed. Mineral Perfection/Tinted SPF 30 or an SPF 30 should be applied every 2 hours during sun exposure. Day 7:The peeling process is generally complete. Mild sloughing may still be occurring in some treated areas. Continue to protect the skin with Mineral Perfection/Tinted SPF 30 or an SPF 30. Click here to learn more about our Services and see what we can do for you on your Rejuvenation Journey! Let’s make an Anti-aging plan together! 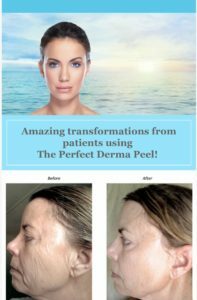 Contact us and schedule a consultation today to find out if the Perfect Derma Peel is the right treatment for you at 941-281-8445! 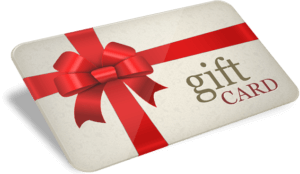 eGift Cards available here! Give the gift of new healthy skin!